We also offer personalised oral health advice to help you take care of your teeth at home, including how to use dental tools, such as floss and interdental brushes. Focussing on your oral health and your own cleaning techniques will help prevent onset of decay and gum disease. We aim to work with you to increase your smile-ability! Due to the increased hormones during pregnancy, your body changes the way it deals with plaque so you may become susceptible to an increased risk of gum disease. If not so effective with your toothbrush, the increased blood flow can cause red, swollen or bleeding gums too. We would happily see you to help resolve any pregnancy related teeth and gum issues, as whilst the onset maybe sudden the issues could have lasting impact. Pregnancy itself does not damage your teeth. Identifying potential gum disease is paramount to ensure that treatment is tailored to avoid future longer term, more serious, tooth and gum health issues. A gum health check is part of our standard check up. Healthy gums are essential before embarking on restorative dentistry. 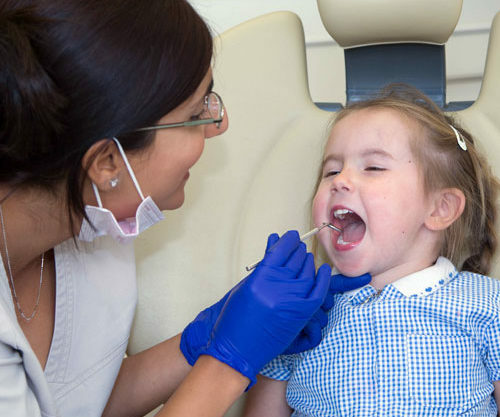 Bringing infants and children to Wargrave Dental Clinic will expose them to the sights, sounds and smells of a dental practice early on, and we can give you advice on caring for their teeth as they break through. Encouraging your child’s oral health from an early age will help them grown up with healthy teeth and a beaming smile. These are a resin based coating painted onto the back adult molar teeth to discourage food and bacteria to harbour in the grooves and cause decay. We recommended that this is administered to children as soon as their adult molars have erupted, usually between 6-8 years old for first adult molars, and 12-13 years old for second adult molars. Sealants can be placed during a regular routine appointment time, they should not be seen as a ‘procedure’. The fissure sealant method aims for prevention rather than cure. Playing contact sports can lead to tooth injury. Wearing a bespoke custom made mouth guard from Wargrave Dental Clinic will secure and support your jaw joints when unexpected force is applied. They are comfortable to wear but remain in place so you can focus on the game ahead. The top and bottom teeth sometimes do not meet when the jaws are closed. This can lead to joint problems and associated symptoms, such as headaches, secular pain and tooth discomfort. We are able to assess which of these maybe present, and provide suggestions to rectify your dental needs. Crowded or misaligned teeth can cause issues in eating, biting, cleaning teeth and smiling. We work closely with local orthodontists to get the end result you’ll be proud to smile with. Oral education can begin at weaning stage by not exposing babies to sugary foods and drinks. We encourage children to come for regular check-ups from the appearance of the first tooth, to ensure that the dental practice is familiar environment, and educate both the children and the parents/guardians on healthy eating, successful brushing and flossing.